Brexit refers to the UK including Britain, Scotland, Wales, Ireland and Northern Ireland, exiting from the European Union. This is a significant historic event as if it goes through UK will have broken off from the European Union, and will go independent in terms of economics, government, immigration, business & commerce, etc. 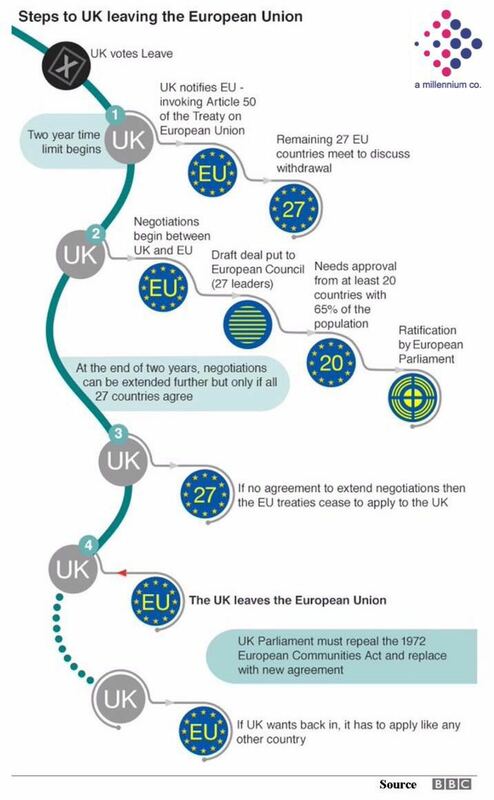 So what is Brexit actually about? It was about the British identity. The concern among the people of UK was about immigration and jobs. Do the British have shared interests with other European countries? Was the association helpful or harmful? People started having doubts on all these aspects, which resulted in the Brexit vote. So to decide this, a referendum was held in UK on Thu 23rd June, 2016. 51.7% people voted for UK to exit the EU. It was a close decision. The Prime Minister, David Cameron has resigned as PM after people voted to leave the EU and will leave his post in 2-3 months. It was an unexpected vote. By next day, Friday, the pound sterling had crashed by 10% against USD, the highest fall in its trading history and its lowest level since Sept 1985. The INR too weakened and stock markets across the world fell sharply – FTSE fell by 500 points while the Sensex closed lower by more than 600 points. Europe hasn’t been doing too well in terms of growth and economics over the last few years; this will be a further blow. One fear is that this may encourage many countries to rethink EU and conduct their own referendum. However my feeling is RoE (Rest of Europe) barring maybe some East Europe countries will stay together. They have strong ties of culture, language, proximity and history. The EU may actually become faster and more responsive to each other’s economic and financial necessities, after this shakeup. The UK is now exposed to several new uncertainties. It will be affected by some new barriers to trade with the EU, which will come into effect soon. Many work immigrants from RoE who were allowed easy access to UK may now have to head back to their countries. This will improve job prospects locally. However UK may suffer as a financial capital, and as European headquarters for many businesses. The red hot real estate market of London may cool a bit. We have seen a high volatility in the GBP against most major currencies. Indian firms with an exposure to UK and Europe too have fallen sharply. Certainly the unexpected Brexit vote has increased uncertainties. However UK has been quite resilient to currency fluctuations in the past. The country is both a big importer and exporter, and the net effect of the recent changes has to be calculated by sector and by company to understand the specific impact. The UK based manufacturer-exporters may actually see a gain due to weaker GBP. However if they need to import significant raw materials, then product prices may have to be adjusted upwards partially. Exports from UK to the EU may see some tariff and non-tariff barriers in future. However this may be compensated by other markets and new bilateral ties. And a weaker currency. Indian companies which have invested a lot in the UK have concerns. Over 800 Indian firms have invested $2.75 billion into Britain in the last few years. Listed Indian firms with operations or subsidiaries in UK may see an immediate 10% drop in revenues and other financials due to the weakened currency. Indian firms with EU assets or subsidiaries should be less affected, as the Euro has weakened only 1.5-2% so far. However higher pessimism prevails as the 27 country EU looks weaker economically. Investors in JainMatrix Investments – Model Portfolios may note that there is no change in the recommended firms due to Brexit. They may continue to hold these or invest in a SIP format as per their investment plan.